Mauget’s Liquid Loadable INJECT-A-MIN® MANGANESE Liquid Loadable is a water based fertilizer for use with most all liquid loadable injection systems . An optimum liquid formulation containing manganese sulfate is for use on palms, maples, citrus and other tree species growing in alkaline soils. 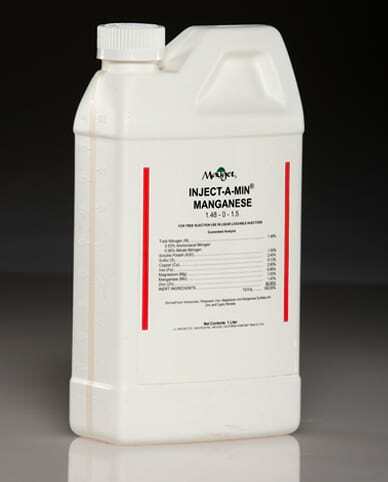 Because the elements are placed directly into the trees vascular system, the benefits of Inject-A-Min Manganese Hp can be evident for one to five years compared to adjacent untreated trees. Manganese deficiency is characterized by young leaves exhibiting darker green veins with a yellowing or loss of color between veins. Symptoms are usually displayed by leaves having darker green veins with a yellowing or loss of color between veins. Young leaves are generally affected primarily. Click on a Nutrient Deficiency for more information.